For Americans addicted to Facebook and Google, a day without the Internet might seem to last forever, but the effect of going offline would be no less traumatic for the entire U.S. economy, experts say. While the economy probably could reverse the damage from being offline a few days, every day without the Internet would be a step closer to calamity for manufacturing, finance and other sectors of the economy. 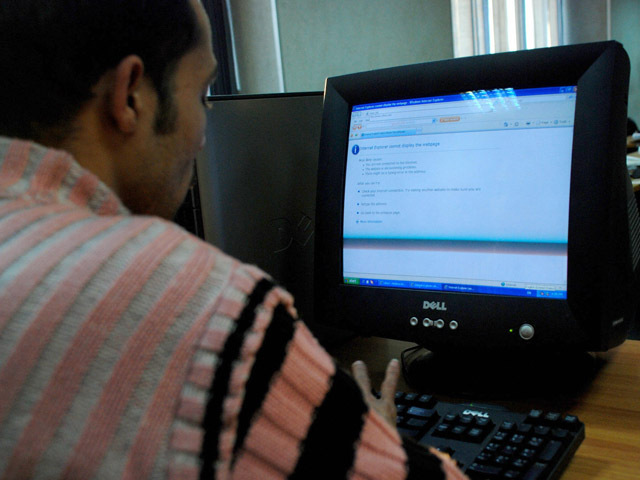 Such would be the consequence if the United States ever followed the example of Egypt, which shut off its Internet Jan. 27 in an attempt to silence widespread protests. A bill introduced in the Senate last summer proposed giving the U.S. president an Internet kill-switch for use in times of emergency. Practically every U.S. business relies directly or indirectly upon the Net for interactions with customers and suppliers. "I just can't conceive of a complete shutdown for long, because it would paralyze the economy," said Andrew Odlyzko, a mathematician at the University of Minnesota who studies Internet economics. Yet the impact might not be catastrophic. Experts said the U.S. economy could probably make up much of the losses if the Internet shutdown were restricted to a few days. E-commerce alone is worth about $8 billion per day in the United States, according to a 2010 report by the Information Technology and Innovation Foundation. Such Internet activities also account for an estimated $10 trillion globally each year. But the possible impact of an Internet shutdown goes far beyond the obvious problems if anyone wanted to buy or sell on Amazon or eBay. The broader U.S. economy has grown intertwined with Internet-based services over the past decade, according to Andrew Whinston, director of the Center for Research in Electronic Commerce at the University of Texas in Austin. That means any company could run into trouble along a supply chain that includes suppliers, manufacturers and retailers, as well as the delivery or shipping services that connect them - all because so much of daily business-to-business interaction has gone online. That's perhaps most exemplified by the trend of cloud computing. "Operating companies are heavily dependent on networking technology, and especially the companies that are part of the supply chain," Whinston said. The wheels of finance and banking also could grind to a halt if an event compelled all U.S. Internet Service Providers to cut off all Internet access. A shutdown of the stock markets, where billions of dollars are exchanged daily, might prove especially crippling, Whinston suggested. "If it went on a couple days, it would probably create financial panic," Whinston told TechNewsDaily. "It would have an impact on ability of companies to raise money as investment funds dried up." But Odlyzko suggested that a directed shutdown of public Internet access could still leave in place certain networks connecting stock markets and banks -as long as the event was not due to cyberattacks that also targeted those closed networks, or to other uncontrollable forces. Much of the economic pain from an Internet shutdown might be only temporary. For instance, many people who were unable to access Amazon or eBay for a few days probably would still end up making their purchases once Internet connections were restored. "While the impact on the U.S. economy would be substantial, it would likely be less than the daily average, because many e-transactions would be postponed, not eliminated," said Scott Andes, a research analyst at the Information Technology and Innovation Foundation. The U.S. economy also has proven surprisingly resilient to shocks from unusual events. When a monster snowstorm paralyzed much of the East Coast during the mid-1990s, economists expected an economic loss roughly equal to the lost working days. But the economy was "flexible enough" to make up for much of that, Odlyzko said. Another case was the blackout of 2003, which left eight states and tens of millions of people without power for up to several days. The event cost the economy about $6 billion, based on estimates by the U.S. Department of Energy. Perhaps the most heartening lesson from that incident was the lack of panic or chaos, according to Pasik of the Institute of Electrical and Electronics Engineers. And that was a full power outage that affected many services beyond Internet access. "If we're talking about short-term loss of Internet, I'm not worried," Pasik said.